Designed to meet or exceed the UFC and IFC at the most cost effective pricing. The NEW SCE4000 and SCE4050 Series Chemical Transport Carts provide the optimum answer to Hazardous Chemical Transportation for the demanding laboratory / cleanroom and warehouse environments. A design with a very stable base, fully lubricated extra heavy duty casters, plastic carts are triple welded and liquid tight; stainless steel carts have tube steel frames to support the load with spill containment compartments and brushed stainless steel exterior. 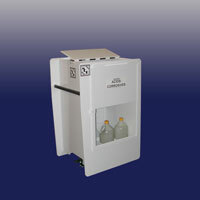 Modular / removable bottle dividers provide a means of restraining containers to prevent accidental dislodgement. Dividers are customizable to accommodate a variety of sizes of containers. Manual foot brake to safely control movement. All materials are selected to be compatible with the chemicals being transported. 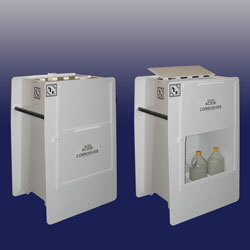 Spill containment is provided for both the top and bottom storage areas. Fully enclosed with top lid and sliding side doors to limit the access to bottles. Careful attention to the ergonomic design to provide the least demand on the personnel using the carts. All of this, plus a design that is cleanroom and laboratory compatible and tough enough to be used on loading docks and in a warehouse.